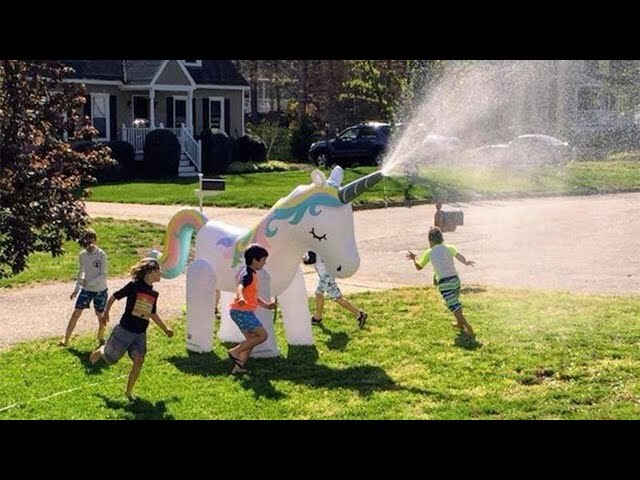 Ginormous Unicorn Yard Sprinkler has been added to your shopping cart! Ginormous Unicorn Yard Sprinkler by BigMouth, Inc.
As seen on Rachel Ray with Katie Linendoll! Our Ginormous Unicorn Yard Sprinkler by Big Mouth Toys will guarantee big time fun all summer long! As seen on Rachel Ray with Katie Linendoll! Our delightful and Ginormous Unicorn Yard Sprinkler by Big Mouth Toys will guarantee big time fun all summer long! This dreamy unicorn-shaped sprinkler is quite the tall drink of water at an impressive 6 feet (or should we say hooves) 4 inches! Measures an impressive 7 feet 1 inches from horn to tail! As seen on PopSugar and Cosmo! This Giant Unicorn Yard Sprinkler is the the most magical of ways to keep it cooll off when the temps rise. Keep the kids cool at birthday parties, backyard BBQs, and poolside retreats. Even better, it's super simple to set up. Just inflate it, connect it to any standard garden hose, and turn on the water to drench yourself in the refreshing rainbow-hued spray of water. The inflatable design also means that it's lightweight, easy to move, and deflates for compact storage in the off-season. An epic gift for unicorn lovers. Imagine how sweet this will be next to your Slip and Slide! Made of durable PVC. Inflated, this product measures approximately 85 inches long x 46 inches wide x 76 inches tall, Our Ginormous Unicorn Yard Sprinkler is the brain child of Big Mouth Toys.